Mike Nicholson has the enviable talent to make any song he sings his own. 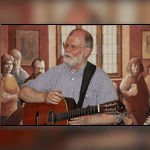 He has a varied repertoire and is not afraid to embrace both traditional and contemporary material which he delivers with ease both in a folk club setting or a concert stage. He has a strong rich voice which is well suited to choruses so you will have to play your part to play.